Spanish Language and Culture Centre is active since 2003. And it is considered to be the leader among the private educational establishments that teach and promote Spanish in Ukraine. The name “CHISPA” is the abbreviation from Centre Hispanic, and it means “the Spark”. The center’s logotype is a registered trade mark. The professional teachers working in this Centre, were on probation in Spain and countries of Latin America. They all have a good command of the intensive communicative teaching methods of Spanish to the foreigners. There is a constant admission to the groups of different levels. Those can be morning, day, evening or weekend kinds of groups. More than 300 students learn Spanish within groups, mini groups or individually. They all mark the high level of teaching, friendly atmosphere and benevolent relation of the employees of the Centre. Do you want to pass the DELE? Are you willing to get to know the history, culture and traditions of Spain and countries of Latin America? Sign up to take a course now! You are free to use: the library, video collection, and you may visit: film forums, communicative clubs and cultural events. 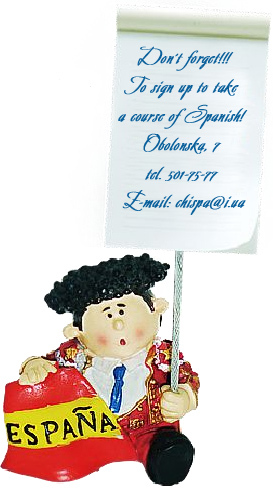 You are welcome to the Spanish Language and Culture Centre «CHISPA»!! !